There is a convergence of land access and environmental justice claims in many of the struggles against extractive activities in Latin America. Drawing on the notion of territory, this chapter explores the nexus between land access, environmental justice and extractivism. The analysis builds on empirical qualitative research on three case studies of peasant struggles for land in the context of the expansion of oil palm agro-industrial cultivation in Colombia since the year 2000. 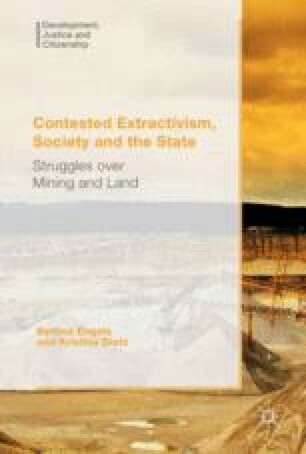 The chapter shows how extractive activities deprive rural populations of their territories through both land access dispossession and socio-environmental transformations. The effects of this territorial deprivation concern four key dimensions of environmental justice: distribution, recognition, participation and capabilities. Contreras, M. (Dir.) & Figueroa, R. (Prod.) (2010, November 12). La tierra y el territorio, online video clip. https://www.youtube.com/watch?v=L59hqRcRfyU#t=477. Accessed 15 Mar 2014. El Tiempo. (2009, July 16). Polémica por desalojo de desplazados en sur de Bolívar. El Tiempo. http://www.eltiempo.com/archivo/documento/CMS-5642386. Accessed 31 Aug 2013. Fundación Chasquis Comunicación, Fundación Contravía. (2011). Las Pavas, la hora del retorno, May 4, online video clip. https://www.youtube.com/watch?v=NJqXTFD2sFA#t=1444. Accessed 15 Mar 2014. La Silla Vacía. (2010, October 7). El caso de Indupalma. La Silla Vacía. http://www.lasillavacia.com/queridodiario/18539/el-caso-de-indupalma. Accessed 17 Sept 2013. Marin-Burgos, V. (2014) Access, Power and Justice in Commodity Frontiers. The political ecology of access to land and palm oil expansion in Colombia. PhD Thesis, Enschede: University of Twente. http://dx.doi.org/10.3990/1.9789036536851. Accessed 13 Dec 2015. The Observer. (2009, September 13). Body shop ethics under fire after Colombian peasant evictions. The Observer online. http://www.theguardian.com/world/2009/sep/13/body-shop-colombia-evictions. Accessed 31 Aug 2013.